I believe I can chalk up my extended absences here to a variety of reasons. Experts tell me I’m not supposed to address it but I’ve decided to ignore them because these days, it seems everyone is an expert on how to blog. To some extent, mentioning it does feel a bit like having to explain to a teacher why my homework isn’t done. And sadly, I no longer have a dog, but if I did she wouldn’t have eaten my homework so I cannot use that excuse. Excuse as in please excuse me for my absence here. Not wanting to look at, be around, or discuss food that isn’t in the realm of possibility for me right now — even in moderation. If I want to enjoy recipes clicking about the web, then ogling cheese seductively oozing from a simple grilled sandwich on white bread will not work — I don’t care how fantastic the quality of the cheese or bread is. Nor will stuffed cookies or cupcakes, or recipes drowning in fat. Sorry. This isn’t to mean I will never enjoy these indulgences again, but that I’m working hard to understand I cannot have them whenever I want. And I’m succeeding with great progress so don’t want to spoil that. Avoiding sitting on the ginormous ball I roll up to the Mac when I write or edit photos. Regardless of whether I take numerous opportunities to do strength exercises on said ball throughout the time I’m on it (no, there will never be photos), I have been trying to stay physically active with projects around the house — and goodness knows, there are plenty. Closets, the garage, a kitchen cupboard reorganization, keeping up with the deadheading on the patio plants. Busy. Well, except for this week. I’ve been keeping that ball warm and procrastinating. I can be very good at it. Getting caught up in what seems to be the mode of the food blogging day. Everybody has a list of what to do and not to to if you have a food blog. It tires me to no end having to think of doing this as one might approach a job. I just can’t wrap my head around it and it annoys me so I have to step away from the Mac in search of a bit of balance. This usually involves absentmindedly reviewing why I started this blog while sweeping my old cat Precious’ fur balls into a neat pile for the third time in a day. And then I snap out of it. I’m just now figuring out I’m retired. Honestly, if you could wake up every day and think as I do that you might do just about anything you’d like, would you sit in front of a computer? I did for years until I realized it was perfectly fine to enjoy life and so that’s what I’ve been doing. (see the first two items above) It’s not glamorous by any stretch of the imagination, but I look forward to it every day. Walking. Lots and lots of it. I try to average an hour or more a day four times a week and although I’ve logged quite a few miles, I’m constantly fighting with myself to get out there. I’m not obsessed, but processing what’s important to me at this point in my life (being mentally and physically healthy as I age) takes time and thought. It’s a pity that all my rumination doesn’t burn calories. Preparing less complicated, healthy food. Trust me, I love a decadent recipe with eight-thousand steps. I do. But for the last five months, I’ve been thinking less is more — just to reboot my system. I will always be someone who indulges in an amazing recipe with all the right ingredients, but for now, I’m restraining myself. This adds up to not much to post on the blog, but I’ll get there. I will. Maybe. But I’m thinking posting a hummus recipe and shooting it with my usual bowl of sliced cucumbers isn’t going to work. Editing photos and writing the post would take longer than making the hummus! The good news is we do enjoy dessert, although not nearly as much as we used to. I’ve given it some thought and would say we average about once a month and the occasion is usually connected to a dinner party or informal get together. I think that’s good because I’ll never give up eating dessert. Considering what kind of dessert, how much, and how often is more the idea. 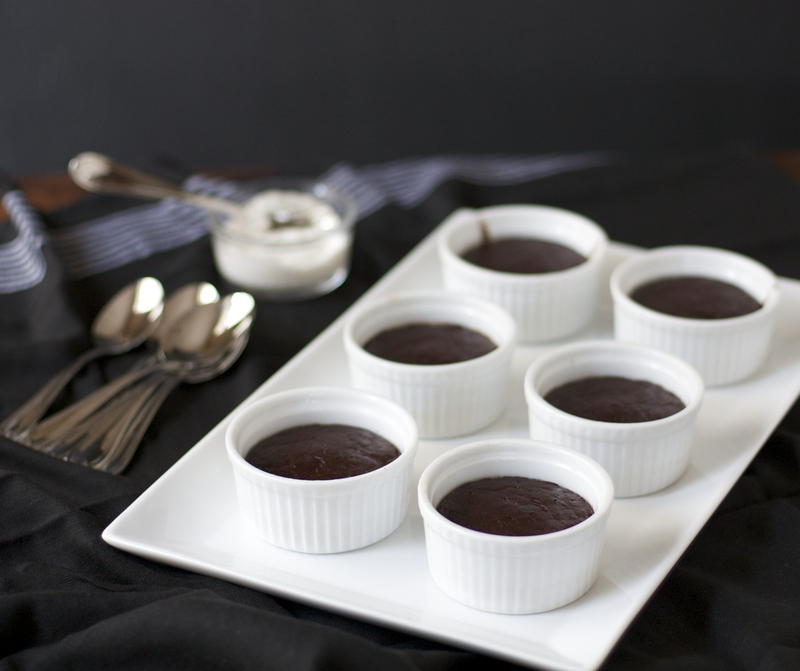 With that in mind, we enjoyed these Chocolate Ganache Whiskey Tortes on the evening of the Academy Awards when one of my older sons was visiting. 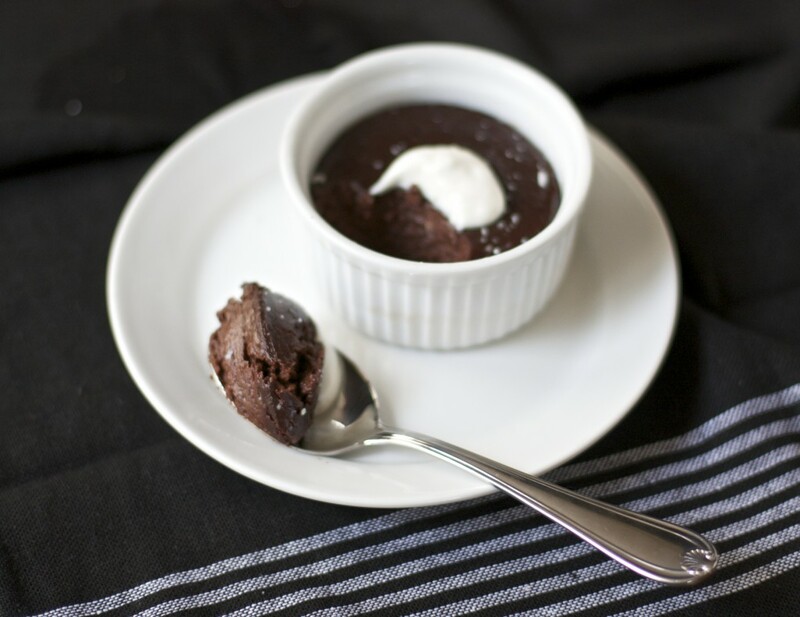 If you love chocolate and only need a little bit to satisfy a sweet tooth, this is a perfect dessert. Preheat your oven to 325 degrees F and make sure a rack is positioned in the center of the oven. 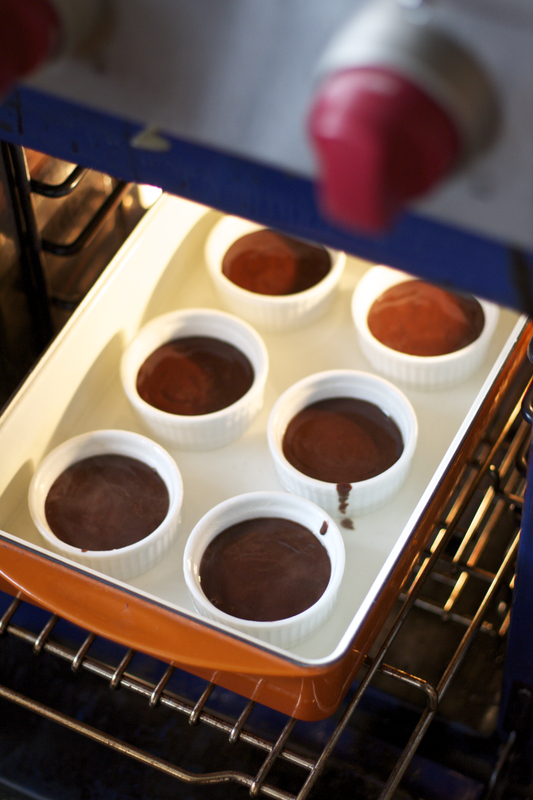 Have ready a baking pan large enough to set six small ramekins and deep enough to hold about one inch of water. Chop or shave the chocolate into pieces no larger than a pea. Place in a heatproof bowl. 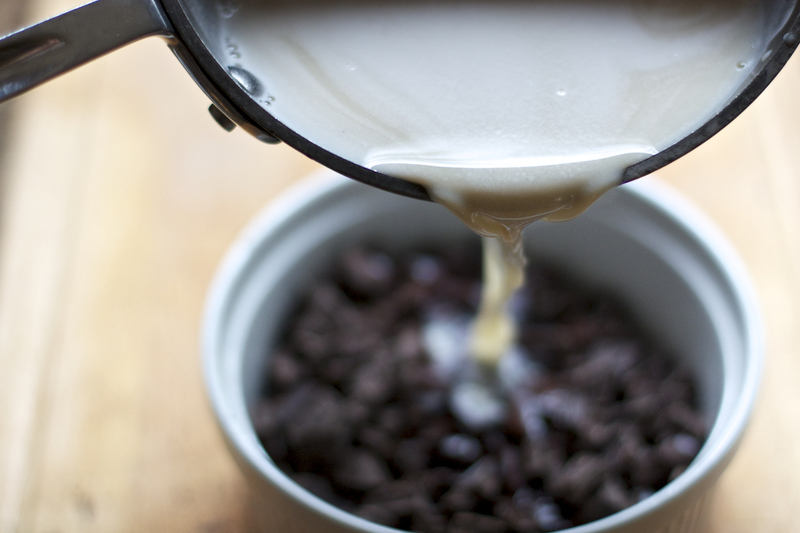 Heat the cream and sugar in a small pan just until the mixture begins to boil, stirring to make sure the sugar has dissolved. Pour the mixture over the chocolate making sure the chocolate is submerged. Allow it to sit for one minute. 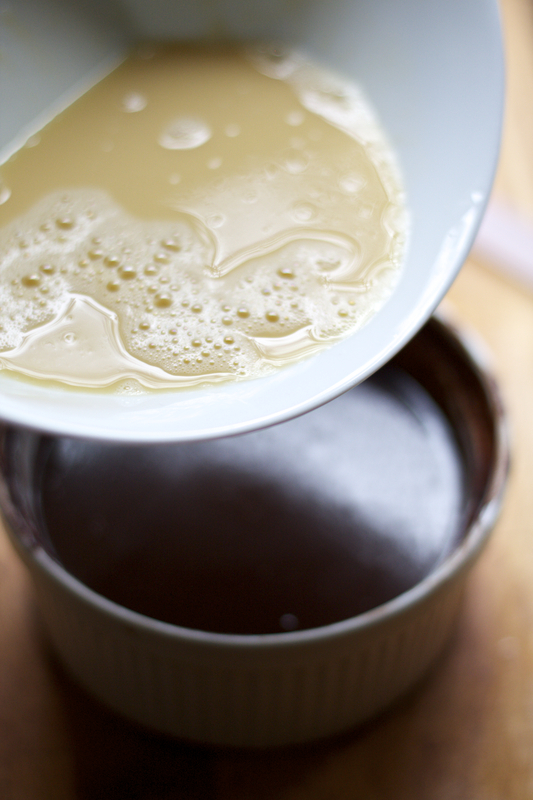 Then use a spatula to slowly stir the mixture in a circular motion, avoiding incorporating any air into it. 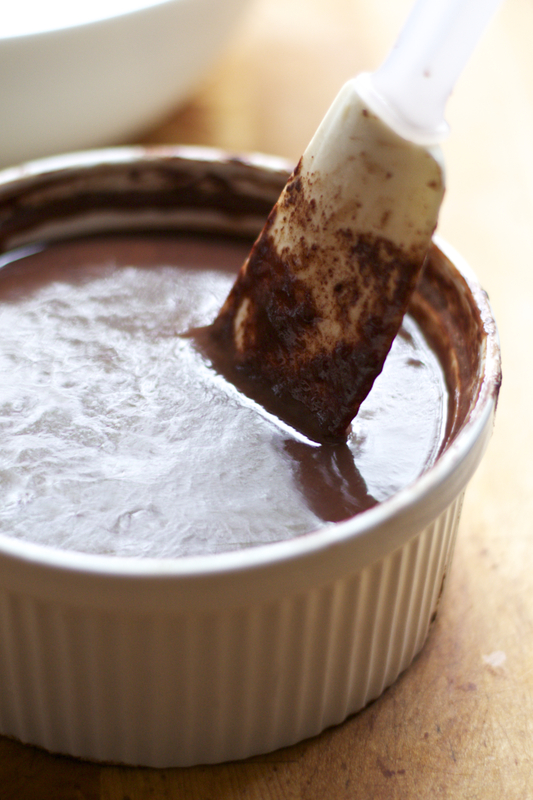 When all the chocolate is melted — about 2 minutes — set aside. 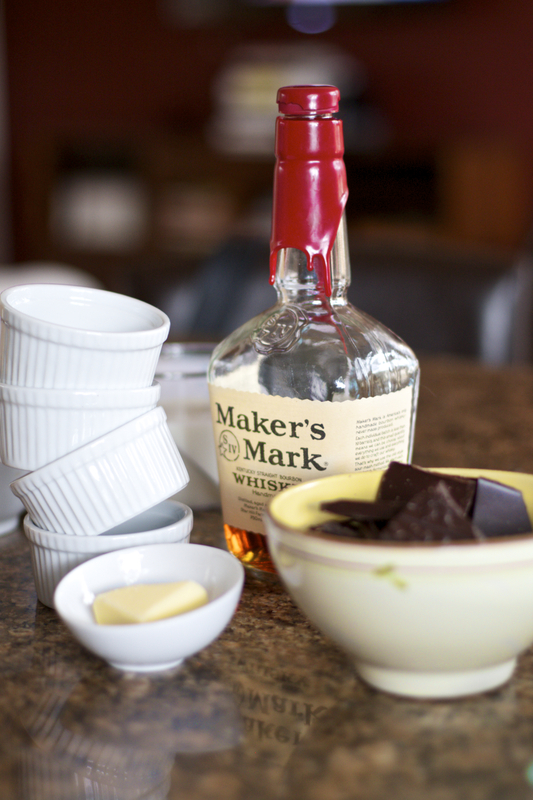 In a separate bowl, whisk the eggs and whiskey together until well blended. 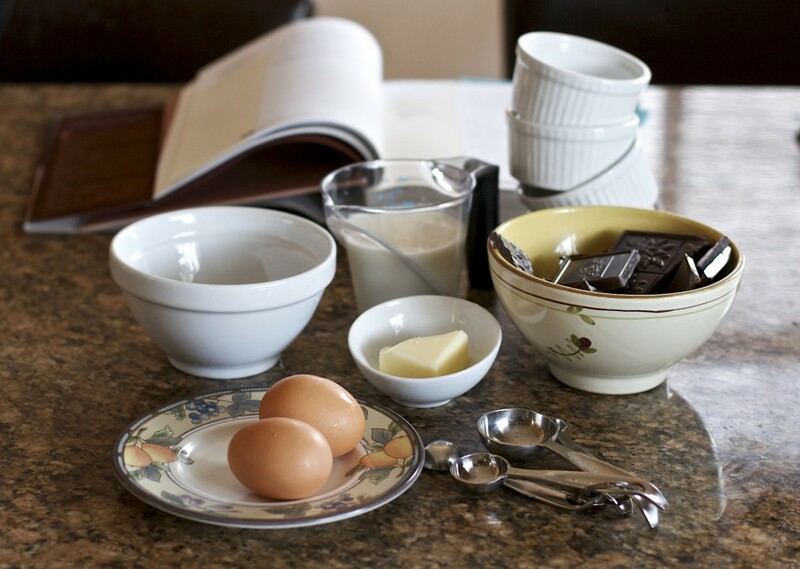 Carefully stir them into the chocolate ganache until the eggs are completely blended into the mixture. Divide the mixture evenly among the six small ramekins. 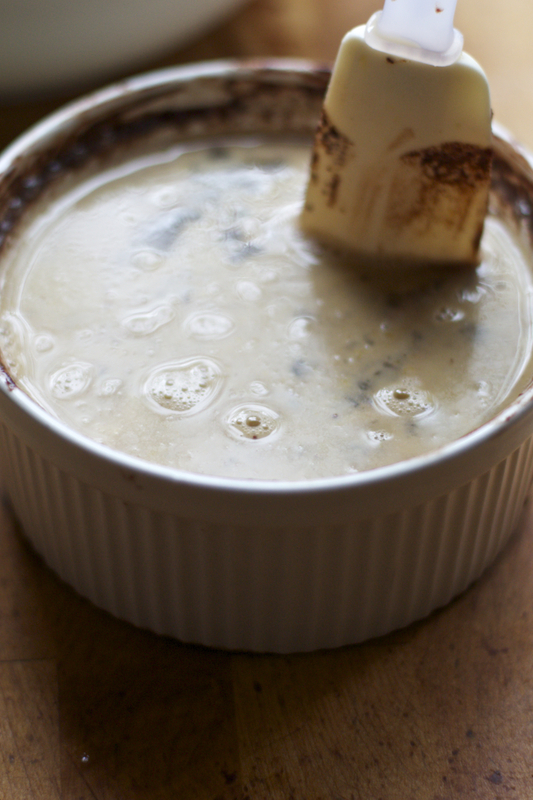 Set the ramekins in the baking pan and then set the pan on the rack in the oven. 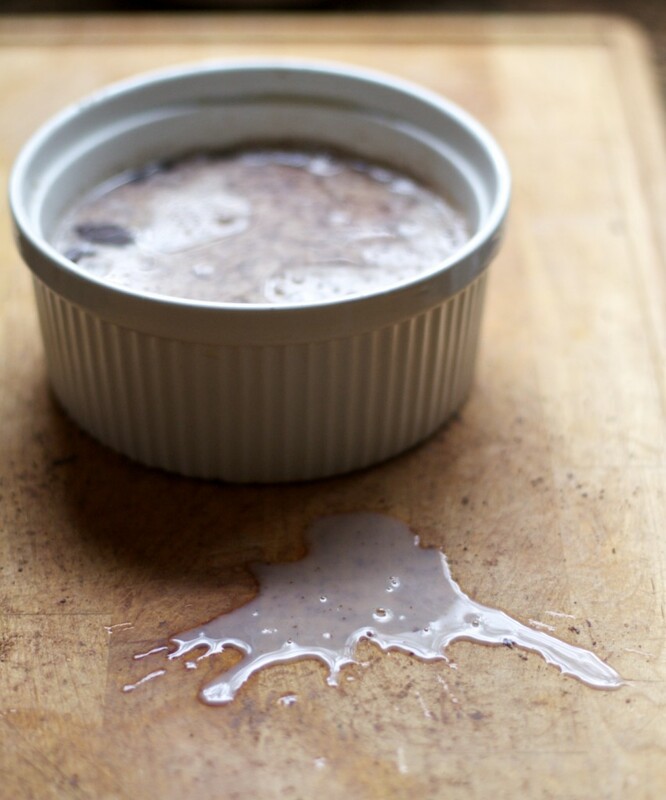 Pour hot water carefully into the pan, making sure none splashes into the ramekins. The water should reach half way up the sides of the ramekins. Bake about 25-30 minutes or until the centers are no longer shiny and feel fairly firm when pressed. Remove from the water bath and allow to cool on a rack slightly before serving with honey sweetened plain yogurt and a sprinkle of Fleur de Sel. This is a Sherry Yard recipe from The Secrets of Baking which is one of my favorite cookbooks. Love. It. Since the hubster and I are strategically choosing the when and what of desserts this year, I thought it would be important to say why this one qualified. There’s no flour in it so that was great for my son who has Celiac’s. And we’ve been working hard to reduce or eliminate white flour food from our diets in favor of whole and sprouted grains as much as possible. Yes, it has heavy cream, but I divided the servings up quite well, so ultimately was rewarded with intensely satisfying flavor in a small quantity. I only ate half of mine! The hubster licked his ramekin. I didn’t do anything to “adapt” this recipe if you want to get technical — at least from my perspective. 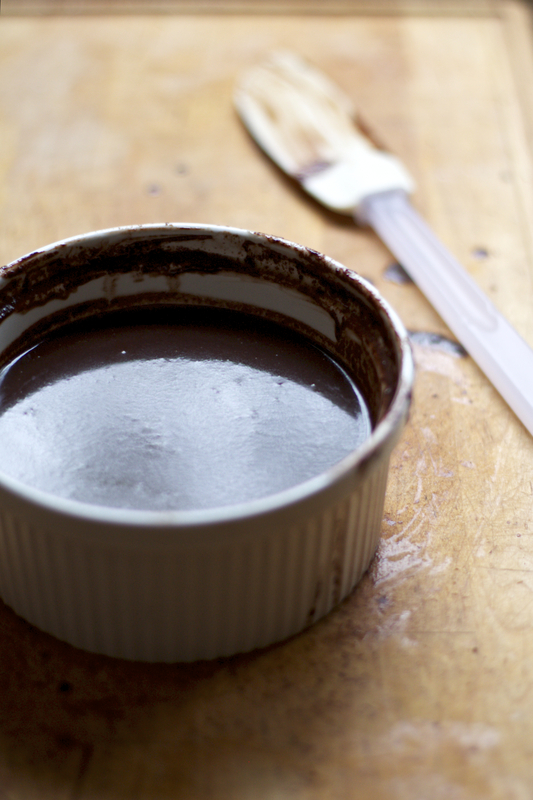 The original calls for four servings in larger ramekins, but it’s so rich that’s unnecessary. And as much as I’d love a dollop of cream on the top, the salted, honeyed yogurt was quite good. 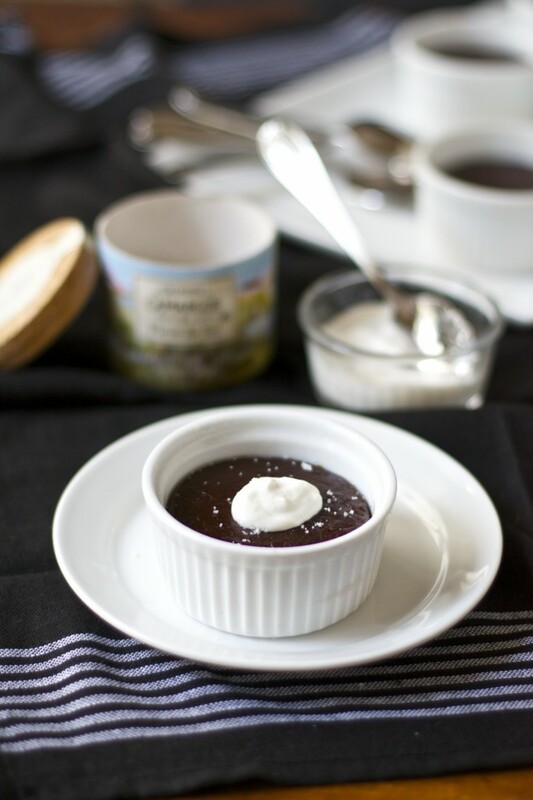 The salty tartness was a perfect compliment to the sweet richness of the chocolate. Watch the oven. The original recipe calls for a 20-25 minute baking time and that’s with larger quantities. I expected that mine would take about 15 minutes and that wasn’t the case. Although I often bake with convection depending on the dessert, I did not this time, yet it took longer. Interesting. Keep an eye on them. When working with a recipe that calls for a water bath (bain marie) like this one, I usually heat the tea kettle and then pour from there. The key as I mentioned in the directions is to make sure everything is positioned in the oven before pouring. There’s nothing more precarious than having to carry a hot baking pan with whatever you’re baking into the oven while hot water is sloshing about. They’re fabulous warm, but if you’re making them for an occasion where you don’t want to have to watch them right before serving, then make them a day ahead, set them out to warm at room temperature and then re-heat them in a 325 degree F oven for about 5 minutes. I made mine earlier in the day and we enjoyed them without reheating. I did sample one warm from the oven and I think the biggest difference is the intensity of the flavor. But that’s usually the case between hot and cold, right? If you don’t own The Secrets of Baking, I highly recommend it. 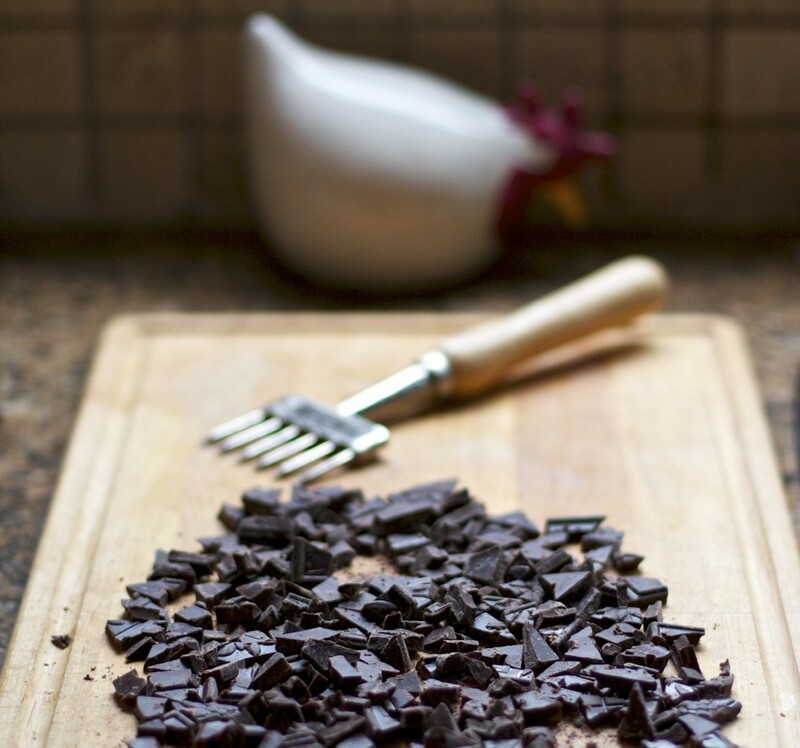 What sets it apart from other cookbooks that feature desserts is that it’s organized around a basic “tree” of basics having to do with ganache (this recipe falls into the “firm” category), caramel, curd, pie & tart dough, brioche, etc. All the recipes include a master recipe which helps you understand ingredients and technique, and then a variety of others based on the master. If there was ever a cookbook I wanted to work my way through for instructive purposes, this would be it. It’s fabulous, but you have to be willing to roll up your sleeves to learn.